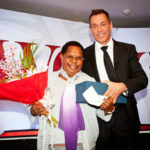 Congratulations to Mrs Maria Linibi who just took out the (PNG) Westpac Outstanding Woman of the Year award. Maria was part of the group of founding and other members of the PNG Women In Agriculture Development Foundation who benefited from Crawford Fund leadership and other training over the years, provided through the Australian Women in Agriculture group, and more recently by a project headed by the Fund’s NT Coordinator, Tania Paul. 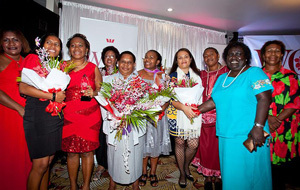 The announcement about Maria’s well-deserved win noted the award recognised “her tireless efforts and sheer determination in helping build the capacity for women farmers in Papua New Guinea and parts of the Pacific”. PNG Women in Agriculture Development Foundation now covers 20 Provinces in PNG and has over 110 registered groups in the country. The group has even established a network in the Solomon Islands and Vanuatu. One of our training exercises enabled Maria and four other women from PNG to attend the “Women without Borders” training event in Darwin in 2010. A highlight of the training was a presentation by Maria as President of PNGWiAgDF and Ms Rufina Peters (pictured) explaining the strategic planning processes adopted by the Foundation. You can listen to an interview with Maria about her award.